Size - Up to 2.5 inches [6.25cm] Usually smaller. Spawning - Cave Spawner, males will guard the 30 or more eggs which will hatch in 5 to 6 days. Fry Care - Fry need to separated from the adults, they can be started on baby brine shrimp and/or microworms. Basic Care - An extremely colorful species. 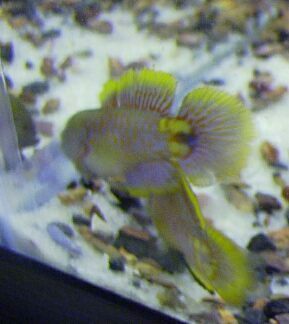 The pictures don't begin to show the true coloration. 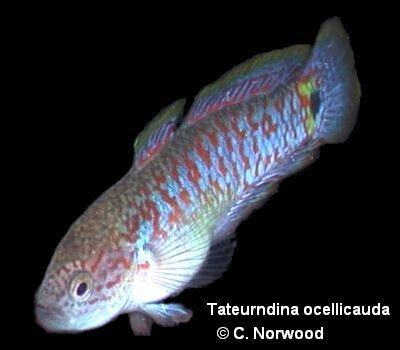 Males and females are colorful, males have a distinguishing hump on their head and most females have a black line accross the bottom of their lower fin. 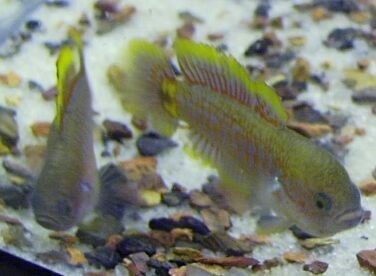 Not too picky about food, and not overly aggressive, although they do a lot of fin flaring and mock fighting. This is a very beautiful and attention getting fish. They stay mainly around the bottom of the tank. The males humphead can be seen clearly here. The male, trying hard to impress the female, who is trying hard to ignore him. My Peacock Gudgeon Tank. they love the PVC "caves", but mostly ignore the coconut cave. 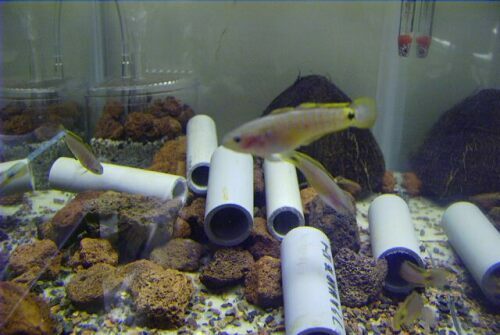 Volcanic rocks are added here for decoration and as a very beneficial aide to filtration. The volcanic rock acts as a nitrate removal system like the more widely used "Live Rock" in saltwater tanks. 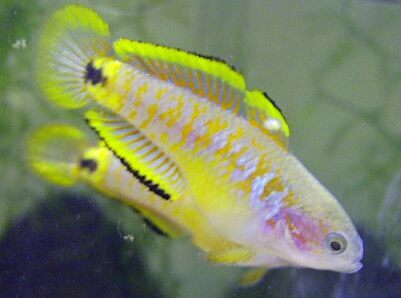 A male Peacock Gudgeon. 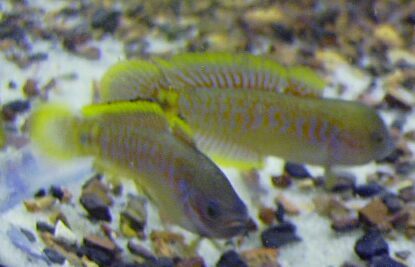 This picture was taken over a dark substrate, notice the difference in coloration with the female pictured at the top of the page, taken over a light colored sand substrate. The peacocks have proven to be easy to spawn with the pvc "caves" and the fry are extremely hardy and easy to raise with the one exception that they refuse all non-live food. © 1996 - 2006, petfish.net. All Rights Reserved. All content is copyright by petfish.net and/or the named author and may not be used without written permission.